The Minion role in Sitecore Commerce is a role that should always be running. It makes sure orders are processed and all housekeeping is done. If you use the SIF installer it will automatically configure a website and application pool in IIS with the correct configuration. Recently I was working with a client to setup a development environment. We had already set up an environment using the SIF scripts, but for this environment we created the websites and application pools for the different roles manually. Everything was working well but we noticed the Minions role was not logging any activity. This shouldn't be the case because the Minions should be running all the time. Most Minion jobs are configured to run every 5 minutes. We had a look at the configuration of the website and the application pool, comparing it to the machine that was working correctly and then we noticed that the start mode of application bool was set to OnDemand. We changed the setting to AlwaysRunning and checked the log files, which were once again filling up with log messages. 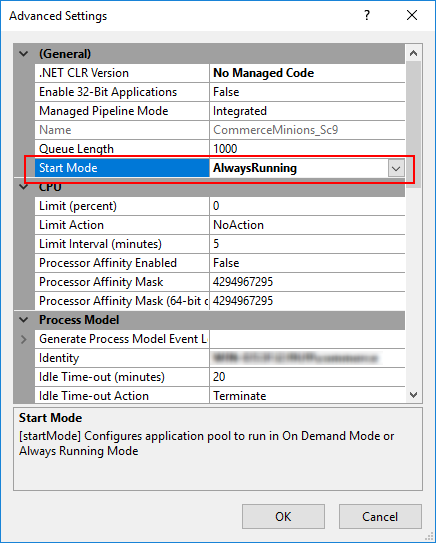 To configure the application pool to be always running, open IIS Manager, go to the application pool for the Minions role and select Advanced Settings. In the Advanced Settings dialog, make sure the start mode is set to AlwaysRunning.